If you need a sample file, please let me know... Thanks! Thanks @IndigoMoon, thanks for the numbers! Have you tried Tone Mapping yet? The algorithm for Develop has been changed in 1.7, so the comparison to 1.6 isn't a like-for-like comparison (wrt the performance change in this build). Yep, pressing the Tone Mapping Persona button (on my very high spec desktop machine it was taking 60 seconds on the progress bar dialog, and it's now down to 5 seconds). #240 --> 23 secs first time, then about 45 seconds for the second try after canceling and finally it ended up with a app crash, app freeze or a complete Windows 10 crash with the third attempt. I've tried it a few times, always with the same result. Not everyone owns such a HIGH SPEC machine ! Startup : 10 min 17 sec !!!!! Hi @HVDB Photography, what are the times in the previous beta or the times in 1.6 for your machine? As I mentioned in the release notes for 1.7.0.240, the performance improvements should scale between high spec and low spec machines. I was clarifying my "60 seconds" timing with the caveat that my machine is very fast anyway. What was the memory usage? Have you enabled the crash identifier in Preferences | Misc? If so I can lookup your crash. Startup : 1 min 27 sec = A tremendous difference !!!!!!!!! Have you enabled the crash identifier in Preferences | Misc? Sure, it was enabled. Where to find these reports? Regarding the memory usage, it's just an assumption, because of the time accumulation after each try. I'm on Windows 10. @IndigoMoon and @HVDB Photography, what version of Windows are you using? A copy of the reports are on your HDD, but I can search for them on our server. I'm assuming your email address (in Preferences) is the same as here on the forum? Yep, it's the same email address. I'm on Windows 10 Home, 1803, i7-3770 and 16 GB. 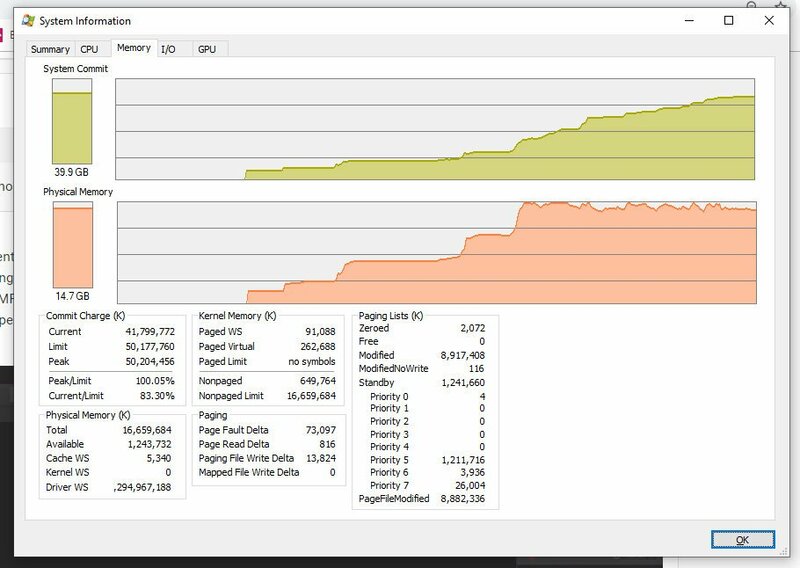 We think the application is holding onto more memory than it should, which is causing Windows to page (i.e. write the contents of your memory) to disk. That would explain the kinds of slowdown you're seeing. Any chance you can tell me memory usage after developing, or entering tone map persona etc? I've now confirmed the bug, and fixed it, and I'll try to get a new build out over the weekend. I've also fixed the issue with Develop converting images to a linear colour profile. That confirms what I had in mind for a long time. The video (at double speed) shows that once the RAW development has been executed, the memory is not released. Although, the extremely long time span at the start of Tone Mapping Persona I could no longer simulate! It now takes an average of just over 3 minutes each time before TMPersona is up and running. I also have to add that I've done a cold reboot and disabled the Superfetch service beforehand. There are different versions of Windows 10. Microsoft upgrades Windows 10 twice a year, one in spring and one in fall. The latest version is 1809 (stands for 2018 and September). I think it would help to add this to the signature too. Tested the Tone Mapping with the 240 Beta last night just before dinner. It hung going into the Tone Mapping Persona at roughly 40%, not quite half way. I left it, ate dinner and returned about 40 minutes later. It had not progressed, and in fact almost caused my entire system to crash, couldn't bring up Task Manager. I did finally manage to force close Photo. I still had to reboot my machine to get it to working smoothly again. This morning, I noticed just 4 minutes after Mark posted the 243 Beta link. Download/Installed, and tried Tone Mapping first, using the same CR2 RAW file as I used last night. WOW what a difference. 12 secs to load into Tone Mapping. Done a few adjustments, then hit develop and 3 secs to develop and back to working in Photo Persona. RAW Development works in .243 much faster now and the correct profile is set after developing in Photo Persona. Pressing the Tone Mapping Icon improves now on my machine to 19 seconds and no crashes anymore repeating the procedure.